The Berkeley Institute Arts Department will be presenting Elton John and Tim Rice’s Aida: School Edition, a contemporary musical take on a grand classic tale, based on the Verdi opera. The story centers on Aida, a Nubian princess who becomes enslaved by Radames, an Egyptian soldier. A forbidden love blossoms between them and their example of devotion eventually transcends the differences in their status and their warring nations and leads to a time of peace and prosperity. The production features a cast of many talented students who have worked with faculty and staff of the school’s Arts Department to produce this exciting piece of musical theatre. 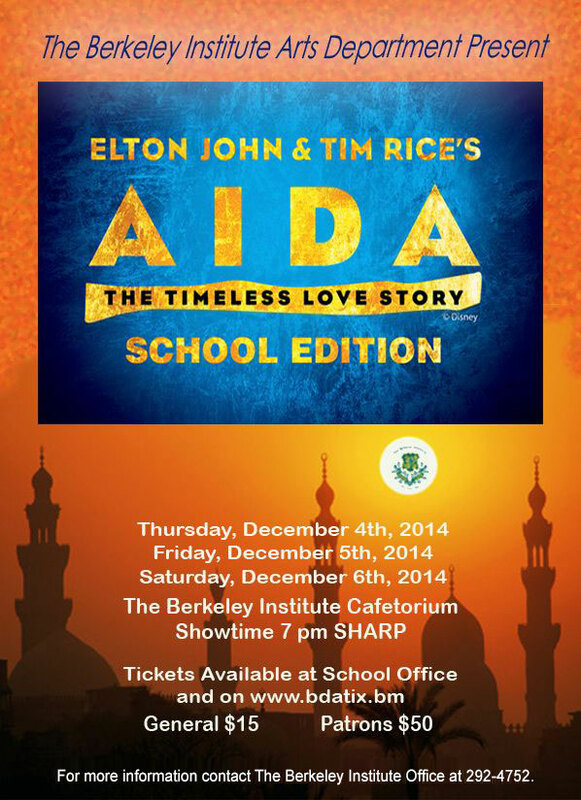 The production will be held in The Berkeley Institute Cafetorium from December 4th – 6th, 2014 at 7pm nightly. “At The Berkeley Institute we aspire to expose our students to world class experiences and encourage them to become leaders in both the local and global communities,” a spokesperson said. Aida is one of the first Productions that I saw. The music from this productions still rings in my ears. I hope to attend the Berkeley Production. Aida is such a great show, saw it in NYC. Looking forward to this!